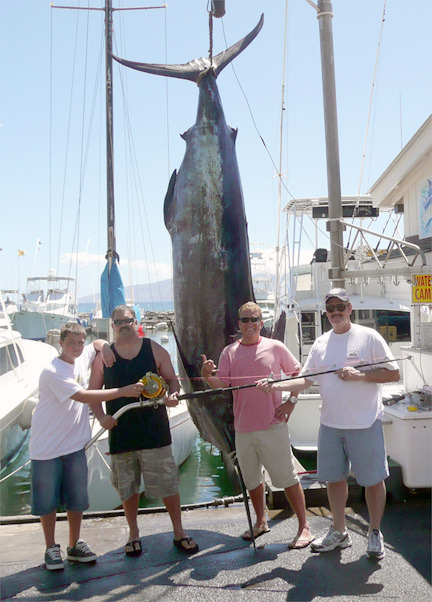 Mike Bixler, Jim Bierd and Michael Skaggs landed the second largest marlin ever caught off Maui, a 1026.4-lb Pacific blue, on July 18, 2007 while fishing on the 42-foot Bertram Sportfisher, START ME UP LA DAT, with Capt. Ryan Fiedorowicz and crewman Ed Nevrivy. They were trolling the backside of Lana'i 3 miles offshore in 230 fathoms with five lures in the water when the monster-sized marlin ate a Moldcraft Purple Softhead. Jim, Mike and Michael rotated on the rod for the next four hours before they landed the behemoth. The fish was caught using 130-lb test Ande line and a Penn two-speed reel.